This Mall will not let u go! 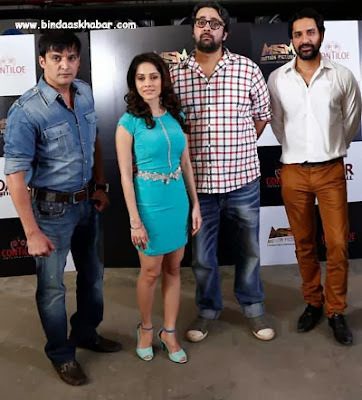 MSM Motion Pictures and Contiloe Entertainment is all set to make mall-hopping a scary experience for audiences with their upcoming horror flick ‘Darr At The Mall’, which stars Jimmy Shergill, Nushrat Bharucha, Arif Zakaria, Asif Basra, Nivedita Bhattacharya, Shraddha Kaul, Neeraj Sood and other actors. The film is a first of its kind Bollywood film, which has chosen a mall as the backdrop for a horror story. Talking about the film, NP Singh, the COO of Multi Screen Media Pvt. Ltd. says, "We have teamed up with Contiloe Entertainment for the first time and we are quite glad about this partnership as Contiloe has been a leading TV production house for horror shows over the years. MSM Motion Pictures and Contiloe Entertainment’s ‘Darr At The Mall’, which is directed by Pawan Kripalani, is scheduled to release on February 21st 2014.This February, the mall will invite you in…but never let you go!